Fr Ken Parker invited Carol O’Connor to give the 5th Bunyip Lecture at St. Thomas', Bunyip, on Sunday the 2nd of December 2018. Here is the summary of Carol's paper, which was handed out to attendees. In the Church cycle, we’re now entering the Year of Luke: praise is a keynote of this Gospel. It’s a ‘Gospel of messianic joy.’ Luke’s emphasis is universal salvation; it is laden with practical ethics and causes us reflection on moral living. Dr Dorothy Lee, Melbourne New Testament Scholar & Anglican Priest. What does gift giving mean? As Christians we believe that the real gift on Christmas Day is the birth of Jesus Christ, but what is it that we are being given? And how do we live in response to this gift? Spiritual and religious books are never an end in themselves - they only ever point the way towards. They point the way toward the ‘Word made flesh’, it’s up to the reader to live from the meaning discovered in the book with courage, with a willingness to risk embodying the Word in themselves. When we are born, we are born into relationship. The primary relationship we are born into is with God. Our first human relationship is with the person or persons who are our primary care givers. Ideally they are figures of love. To grow and flourish through childhood we need the other - the one who loves us. The network extends outwards into community, between cultures. ‘We go to heaven in one another’s pockets,’ is a phrase quoted by Rowan Williams. We take community with us wherever go because we take with us our capacity for relationship in God. 2 The gift of memory always happens from the place in which we stand in the present. It’s meaning derives from the relationship we have in God. Good spiritual writers can give us courage to face our own terrors and examine memories that are painful. Go to the hard places, especially in your relationship with God, stand there and see what you can see. Go to the hard places with the eyes of God. Ask: what can I see or re-see in and from this challenging place? For Miroslav Volf it’s important to remember the past rightly. Christ’s Passion and resurrection need to inform how we engage in the action of remembering. It’s important to learn to live theology, not just read it in books. Remember God’s love in all that you do. Good spiritual writers give us a language that can help steady our feet; words that enable us to enflesh or put form around our experience. They offer a language, a vocabulary, upon which I can invite my own experience into and hang my own thoughts upon. The gift of language can provoke our imagination; push further the boundaries of reflection. Language grows us. Writers like Rowan Williams & Richard Rohr offer vocabularies that are living and nuanced. As they’ve drawn from other writers, through their words God speaks to us. Theirs becomes a language which I can draw from, dwell upon, and in turn hope God uses through me to speak to others. And this is a gift giving whose primary source is the Word made flesh. Both Rowan Williams and David Adam encourage us to take the words we use in our prayer life seriously. They encourage us to find prayers to sit with, have them walk them inside us inside as a mantra. And we can only do this when we enter into ‘slow craft time.’ In his book Holy Living, Rowan Williams reminds us to stay present ‘where you are, rather than taking refuge in the infinite smallness of your fantasies.’ Expansion of the heart takes time. Williams quotes the Welsh saying: ’life is about inhabiting a great hall within narrow walls.’ P 65. For him, and so many of these writers, life is about learning to be still and listen, to ponder, to be fully present to the place you are in. Language takes many forms. God also speaks through the expressive arts: music, poetry, dance, painting. God’s Word is found in nature and in silence and the unsaid. The grammar of God is in the nature of created things and lives inside each one of us. If our language serves reconciliation, breaks through the illusion of separation and hate, of fear and abuse then our lives start to become aligned into the enlarging the heart of God. I can purchase or read all the books about God I like, but if I do not live first from response to this space of Love, and if my first book is not, as Holy Anthony says, the nature of created things as seen through Love’s eyes, then what I see will be forever only an illusion. The gift of the Word made flesh, with all its hope and beauty and pain and vulnerability, the gift of Christ who is born at Christmas, enables us to see through illusion to Reality. And that’s a Word really worth holding onto. 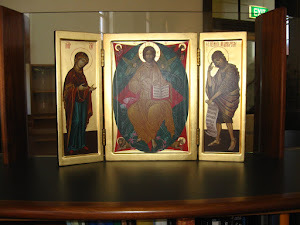 The Library of the Icon School of St Peter - Melbourne Inc.
John Bayton founded an icon school in 1982, when he was vicar of St. Peter’s Eastern Hill, Melbourne, initially working in the vicarage kitchen. In its heyday, the Icon School of St. Peter was both a teaching institution and a workshop for established and novice iconographers. There was a waiting list to join the School, which met every month on a Tuesday morning at Eastern Hill. It is one of a number of such schools and groups operating in Melbourne, firm in its adherence to Byzantine practice. Several past members went on to found schools themselves. Some thirty-six years later the School this year made the decision, after some discernment, to close. Over time, members of the School contributed to the building up of a considerable resource library. There are folio size books of different vintages containing reproductions from all the great traditions – Orthodoxy in its different forms, especially Greek and Russian, Coptic, Ethiopian – as well as the immense work of the churches of East and West in the latter half of the twentieth century, as the interest in icons spread throughout the world. Then there are standard works on icons, their history, theology, and aesthetics, as well as handbooks for iconographers and supporting art literature, especially in Byzantium. Pamphlets, monastic guidebooks, calendars, anything that assists the iconographers in their work, were collected as well, by members and friends of the School. Names inscribed in the books provide their own history, giving some idea of the many iconographers who were part of the School: Connie Barber, Susan Basset, Bp John Bayton, Judy Bink, Rose-Claire Boyd, Brian Bubbers, Mary Casey, Sr Jean Coutts, Fr Lawrence Cross, Sr Sheila Ann Erasmus, Pat Gravette, Anne Gumley, William Johnston, Molly Longfield, Kay McLennan, David Rogers, John Round, Frank Upfill, and Helen Young. The Very Revd. Fr Nicholas Karipoff, Dean of the Russian Orthodox Cathedral Brunswick East, facilitated many visits to the cathedral and as guest of honour, spoke at the 30th year anniversary dinner of the School. The collection was housed in a locked utility cupboard at St. Peter’s. It would be unlocked during sessions of the School and referred to regularly. Because the School became an incorporated entity, the winding up of its business required a divestment of assets. 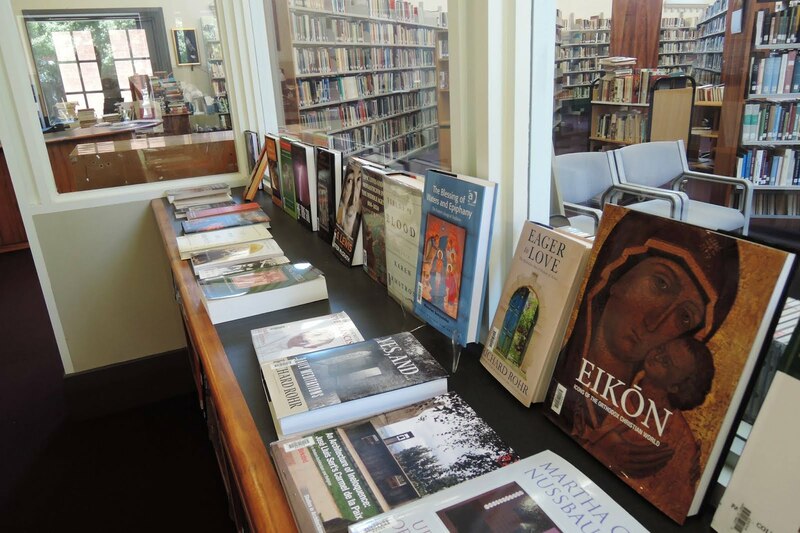 The School, under the guiding hand of its Librarian and Treasurer Brian Bubbers, elected to donate the asset of its book collection to a theological library with strong holdings in icon books and a commitment to this ancient practice: the Carmelite Library of Spirituality. In November the collection was transported from Eastern Hill to Middle Park, where the books were gradually processed and added to the existing Carmelite holdings. This means the Carmelite Library now has the strongest icon book collection, both for pure and applied reference, in the University of Divinity. It is one of the best in Australia. The transfer of the School’s icon book collection happened to coincide with an exhibition during November of over fifty icons in the Library made by the Seraphim Icon Group. At the lecture night for this exhibition, I talked to the many practising iconographers in attendance about the availability of the collection for their work, and of the Library itself as a home for icon writing. The Library has a history of hosting iconographers, as well as offering lecture series in which many scholars, artists, and others interested in icons, have spoken on this endlessly rewarding devotional and creative activity. One door closes, and another opens as the active interest and participation of iconographers flourishes in Melbourne and beyond. The Seraphim Icon Group held its inaugural exhibition of icons in the Carmelite Library through the month of November, 2018. Here are some of the icons, photographed by Susan Southall. Icon Group used this work table for their new icons. St Mary McKillop, and a Chinese Annunciation. On Wednesday the 7th of November, Sr Paula Moroney OCDM conducted a Carmelite Conversation in the Library on Saint Elizabeth of the Trinity. Sr Paula used Elizabeth’s Prayer to the Trinity both as the means to spiritual reflection and as access to Elizabeth’s own spiritual life. O My God, Trinity who I adore, help me to forget myself entirely that I may be established in You as still and as peaceful as if my soul were already in eternity. May nothing trouble my peace or make me leave You, O my unchanging One, but may each minute carry me further into the depths of Your mystery. Give peace to my soul, make it Your heaven, Your beloved dwelling and Your resting place. May I never leave You there alone but be wholly present, my faith wholly vigilant, wholly adoring, and wholly surrendered to your creative action. O my beloved Christ, crucified by love, I wish to be a bride for Your heart; I wish to cover You with glory; I wish to love You even till I die of love! But I feel my weakness and I ask You to "clothe me with Yourself," to identify my soul with all the movements of Your soul, to overwhelm me, to possess me, to substitute Yourself for me that my life may be but a radiance of Your life. Come into me as Adorer, as Restorer, as Saviour. O Eternal Word, Word of my God, I want to spend my life in listening to You, to become wholly teachable that I may learn all from You. Then, through all nights, all voids, all helplessness, I want to gaze on You always and remain in Your great light. O my beloved Star, so fascinate me that I may not withdraw from Your radiance. O Consuming Fire, Spirit of Love, "come upon me," and create in my soul a kind of incarnation of the Word: that I may be another humanity for Him, in which He can renew His whole mystery. And You, O Father, bend lovingly over Your poor little creature: "cover her with Your shadow," seeing in her only the "Beloved in whom You are well pleased." When we come to know Elizabeth, this ever-young Carmelite, we are struck by her "living smile that radiates Jesus and gives Him to others." (L.252) She was animated by a sublime mystery which filled her life, the mystery of the Divine Indwelling, and hence her inner joy in communion with her Three ever present in the Trinity and her happiness in living and sharing that love. The centre point of her spirituality is the PRAYER to the TRINITY containing the essence of her holiness and beauty, her love and faith. The unfolding of her vocation came with the knowledge that "There is a Being who is love." Captivated by the mystery of the Trinity of self-giving love, she was drawn into a deepening relationship with this God who called her to the fullness of being. St Elizabeth of the Trinity may not have a ' high profile', nor did she leave a vast quantity of writing. She was still young, only 26, when she died in 1906. 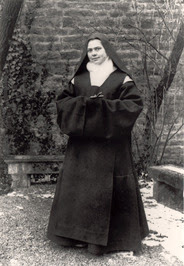 Being a close contemporary of St Therese, she remains somewhat in the shadows, for Therese was already on the way to sainthood and her "Story of a Soul" was into its 6th edition. Elizabeth's life was no less heroic and her message no less profound, far-reaching and soundly based on scripture. Neither was she a theologian but a contemplative prayerfully pondering the sacred texts, especially the Letters of St Paul and St John's Gospel and taking to heart the instruction she received. She was someone with a message to share at whatever stage of life we may be. Growing up Elizabeth was far from angelic but a 'true devil' who could fly into tantrums. Photos show her little face, dark eyes blazing, holding her doll Jeannette - the doll she recognized as hers when it was borrowed to be the Infant in the crib. She was furious. "Give me back my Jeannette!" she yelled. This little girl had fire in her veins. She had a mind of her own and flared up when her will was crossed, almost every day. Once she had learned to control her temper she became sensitive and considerate. Her great prayer has fire too - and fervent desire. Obviously this child had strength of character but we can scarcely imagine how much she suffered when as a 7 year-old her beloved father died in her arms. With her mother and her younger sister, Guite, the family settled into a new routine. They moved to a smaller apartment which happened to be just around the corner from the Carmel of Dijon. Gradually she tamed her unruly spirit and is much more in control at the age of 10 when she made her First Communion. A longing for Carmel soon possessed her but there were years of waiting and obstacles since her Mother refused permission and then became seriously ill so Elizabeth could not leave her. In these years Elizabeth found a new apostolate, teaching catechism to groups of workers' children from the local tobacco factory. She had a gift for communication and found them an original patron, "Our Lady of Tobacco". Elizabeth had music in her soul. Her piano gave expression to her gifts and at 13 she won First Prize at the Dijon Conservatorium for her performance of Mendelsohn's Cappriccio. She played with talent beyond her years, interpreting with feeling the lyrical lines which alternated with flowing rhythm in the refrain and tumbling chords in the virtuoso coda. The romantic strains of this music unleased a beauty she felt deep within. Again the following year she won distinction with her brilliant performance of Liszt, Hungarian Rhapsody No. 2. With its haunting theme gathering momentum as it dances with vitality, it suited Elizabeth's fiery temperament. She was versatile, sensitive and passionate, with a power of concentration enabling her to acquire skill and ease in performing. Music was her prayer and she forgot herself at the piano, expressing her deepest desires and feelings; she could communicate shades of life, perceptions of understanding, both exquisite and painful, sensitive changes of rhythm and tone which delicately coloured the texture of notes. Her human heart was touched by the divine and grace entered in. Open to the spiritual world of music she became more human and more tender-hearted. During these years life was a round of social events as the Trio, Mme Catez, Sabeth and Guite, set off each year for 3 months vacation, travels and visits with music, dancing and reunions. Elizabeth's charm and her attractive personality won many friends. She had an eye for fashion and was a skilled seamstress who revelled in buying 'ravishing materials' to make her creations, (we notice the stylish blouses and hats in her photos). She probably broke some hearts by turning down offers of marriage. A deeper love continued to grow in her heart nurtured through her spirit of prayer. While life was lived to the fullest, mystic graces flowed from her unselfish giving and fidelity. She was a young lady who could become anyone she wanted to be. "When you feel loved you are open to any thing," she wrote later to Guite. Everyone felt loved by Elizabeth, even the Sister who was known to be difficult. She was the one who later remarked, "How she loved me!" We talked of music, she recalled, and she drew me to God through that. We see from her correspondence and writings that she had a way of imparting her knowledge and understanding, making it attractive and accessible. She liked to share her insights and her many letters to family and friends are testimony of this. A few days before her death she made the effort to write and thank Dr Barbier, the physician who had been tending her, a non-believer, leaving for him her book of the Letters of St Paul. The essence of Elizabeth's desires and holiness is distilled in her Prayer to the Trinity. In four clear paragraphs she has given us rich theology with a vast and broad sweep reaching above and beyond the human element to the timelessness of eternity. It is at once unselfish and personal, composed with the clarity of mature vision. As she prays she steps aside and asks, not for obvious tangible benefits but to entirely forget herself, to lose herself in God's mystery. The language of love and intimacy takes on the grandeur of infinity, entering into realms of transforming union. The prayer is the intimate expression of her soul and she never ever spoke about writing it although she herself must have returned to it often. Only after her death was it discovered in her little writing box of personal papers. Of her few private possessions this folded sheet on thin ruled paper torn from a notebook is most precious. It is dated 21st November 1904, the feast of the Presentation of Our Lady, the day the community renewed their vows at the conclusion of their annual retreat. How Elizabeth longed to belong wholly to God, to be transformed in God! 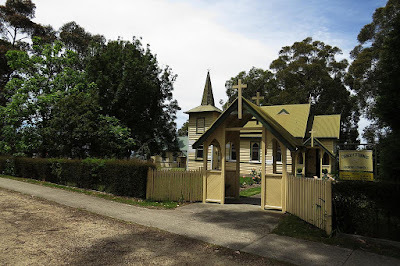 She had entered into the spirit of the retreat with Fr Fages on the theme of the Incarnation and offered herself totally, like Mary, disposed to be another humanity for the Word to renew His Mysteries. Here she is captured by the sublime truth and begins by addressing the Trinity: O MY GOD, TRINITY WHOM I ADORE. With solemn reverence, as St Therese began her Act of Oblation and St Catherine of Siena once prayed, so Elizabeth addresses her prayer to the Trinity. Yet there is peacefulness in her soul set in the stillness of contemplation, and she enters completely into this new dimension. To look within is to gaze on the Indwelling God, so that the loving soul becomes one in spirit. In that single gaze she remains present, vigilant, adoring, surrendered to the divine creative action. Christ is her Beloved, crucified by love, and it is love that gives meaning to His death. She longs to show her own Bridal love and identify herself with her Beloved, to 'cover Him with glory', reflecting her chosen vocation to be the 'Praise of Glory'. St Paul is her constant inspiration now. Conscious of her weakness she begs that Christ substitute for her and then she will take on new radiance reflecting that light. May Christ come 'as Adorer, as Restorer, as Saviour' in her - that is her positive hope, and her silent praise. The next words are full of power and personal inspiration showing she has absorbed the profound theology of the Incarnation, the Word living in our midst as one of us. We notice that she has used 2 different nouns in the original French, 'O Verbe Eternel', and 'Parole de mon Dieu', the first having reference to the Word in the Prologue of St John's Gospel, as the visible thought and action of the eternal God; the second as the Word which is spoken and heard in human language - the divine and human. She had already asked to be able to "spend her life listening to You, (God's Eternal Word) to become wholly teachable, to learn all from You", and then to remain in that light, fascinated by the radiance of the "Beloved Star", but it is no ordinary star, (etoile). She chooses another word 'Astre', in French to denote an unusually bright beautiful night light. Her Star will shine through all nights, voids, helplessness and she senses it will be her guide. In the dark night, it is her Christ, crucified by love, pouring out his love, who is her light and draws her onwards with courage. "Let nothing disturb you", was St Teresa's refrain; "God alone is sufficient." We are aware that Elizabeth wrote her Prayer as the community completed their retreat on the theme of the Incarnation when Fr Fages had invited the Sisters to pray in the following words: "Spirit of God, come upon me as you came upon the chaos of the world, as you came upon the Virgin Mary to create in her Our Lord." This obviously meant a great deal to Elizabeth who must have reflected upon it at length and made it her own. Returning to the full tableau in the concluding lines she sums up the whole mystery as she addresses her Three, gathering together the richness she has assimilated, "my All, my Beatitude, infinite Solitude, Immensity in which I lose myself" - she longs to contemplate in the Light of eternity "the abyss of ...greatness." There is a certain progression from one paragraph to the next. At the beginning she creates a setting of peace, praying for stillness to be established and so enter into the depths of the Godhead. Then looking upon Christ, her Beloved, she is held in that gaze, reflecting His radiance. She will go further and herself become another humanity for him to live His mysteries. The Spirit and the Father accomplish for her what she cannot do herself in fulfilling a relationship where all is transformed in the greatness of infinite love. Ultimately in eternity we are destined to contemplate unceasingly this abyss of grandeur, described by St Paul as love in its height and depth, length and breadth. (Rom. 8:5) The radiant Star of the second paragraph becomes her light, her Radiance, and Creation is included and caught up in the action until Elizabeth is lost in this abyss of immensity. Such is her faith reflecting a deep understanding of sublime mysteries, absorbed as she was in the mind of St Paul, St John the Evangelist, St John of the Cross, in the mystical language of St Catherine of Siena and Ruysbroek, and in the spirit of St Teresa and Therese - they are all friends who speak to her and connect spiritually. They influenced her writing and intermingled in her thoughts, open as she was to receive grace and share glory. Elizabeth read and reread passages of Scripture, particularly St Paul's Letters to the Ephesians and Colossians, until she was immersed in them and they lived on in her. This is the way she would have practised her piano repertoire, repeating a theme and listening to its overtones as it developed and flowed under her fingers. The Prayer evolves is an artwork too. What is contemplated in prayer is now painted and captured in words. Elizabeth is writing her icon, first the setting in the opening paragraph showing careful preparation and prayerful study; then the composition, drawing up the theme and blending colours to show the movement of the Three in One. Here the artist is plying fresh layers of colour till she achieves tones of richest hues. In the final section the finishing touches seal and preserve the whole. One is reminded of the timeless icon of Andrei Rublev where interaction bespeaks unity in one sensitive movement, the offering of mutual tenderness. Without doubt Elizabeth, so young herself, greatly admired her 'Sister', Therese, 7 years ahead of her, sharing the same spirit of loving confidence and surrender. At Dijon Carmel they kept the anniversary of Therese's death and when she was 18 Elizabeth had read the "Story of a Soul", already being circulated among the Carmels only a year after Therese's death. She found the Act of Oblation where Therese expressed what she held dear in her heart, so it is not surprising that later Elizabeth was moved to write her Prayer with its distinct, individual spirit. Hers was another exchange of love with the Trinity in contemplative silence and adoration, receptive to every movement of grace, knowing that her mission was to offer others an awareness of Presence, living the prayer of love which is a most active and vital calling. Like Therese, Elizabeth lived by love in her encounters in daily life no matter who she met, so that her Sisters noticed that even in her illness and extreme weakness she never lost her peace. In fact through months of enduring suffering in darkness and agonizing pain she still accomplished "a thousand little services to those around her." Real love flowed from her prayer. The Prayer once discovered had its own profound influence on the community as it does today. There is the instance of the Chinese Jesuit who studied in Rome and on returning to China was arrested and held in solitary confinement for almost 2 decades, without visits or contacts, not even books. However he kept in his memory certain passages from St John's Gospel and a Prayer beginning "O my God, Trinity whom I adore..." This he had learnt from a young French priest when they were students together and this young priest told him how he spent 20 minutes daily slowly pondering a phrase from the prayer and relating it to his own life. Eighteen years later when released from prison the Chinese Jesuit said that this is what enabled him to survive. The incident is related in the life of Cardinal Albert Decourtray. This world of time and space exists within the eternity of the spiritual where God is revealed in truth and goodness, in human relationships and in the language of creation. Elizabeth understood her mission was to draw souls into interior recollection in inner silence so that God can give Himself to them and transform them in an exchange of love. Through her example she would lead others to prayer and stillness in this age of incessant activity. Her secret was to find the Divine presence here, where we are now, in the present moment, filling it with love, gently, in the unseen grace where silence can speak and we come into the light of truth. Wherever she was, at each stage of her journey, growing up and blossoming into an attractive and fashionable, intelligent and gifted young woman of society, constantly enjoying the charms of music, friends and travels, she found God in tranquillity of heart. As a simple Carmelite novice emerging in community she gave herself generously to others and finally in accepting the ravages of a painful incurable illness, she was able to draw peace and strength. It was this conviction of the reality of Divine love she longed to share because "Time is eternity already begun and still in progress."